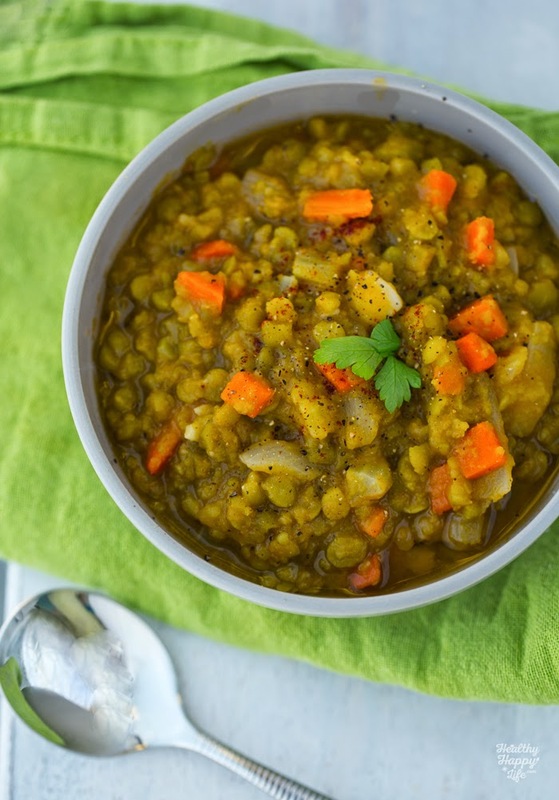 Easy Vegan Garlicky Pea Soup. 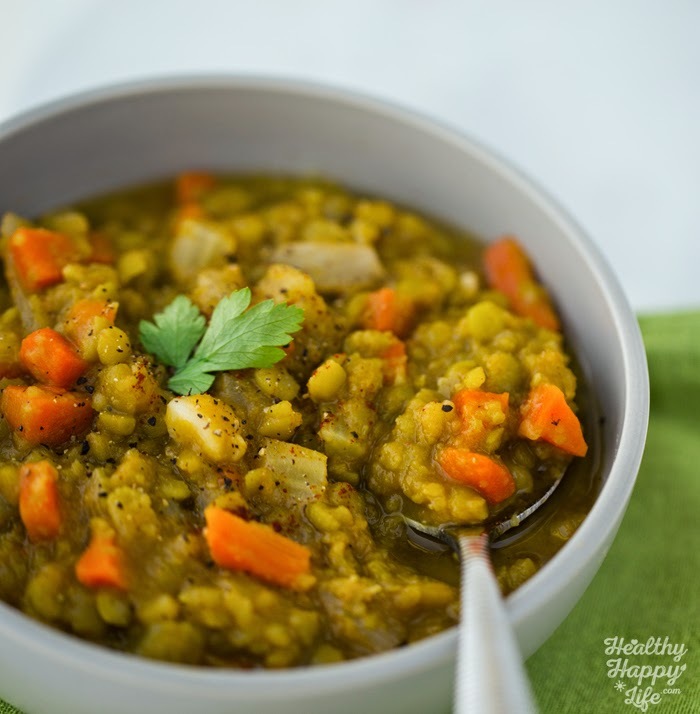 This Easy Vegan Garlicky Pea Soup is warm and comforting, thick and flavorful. 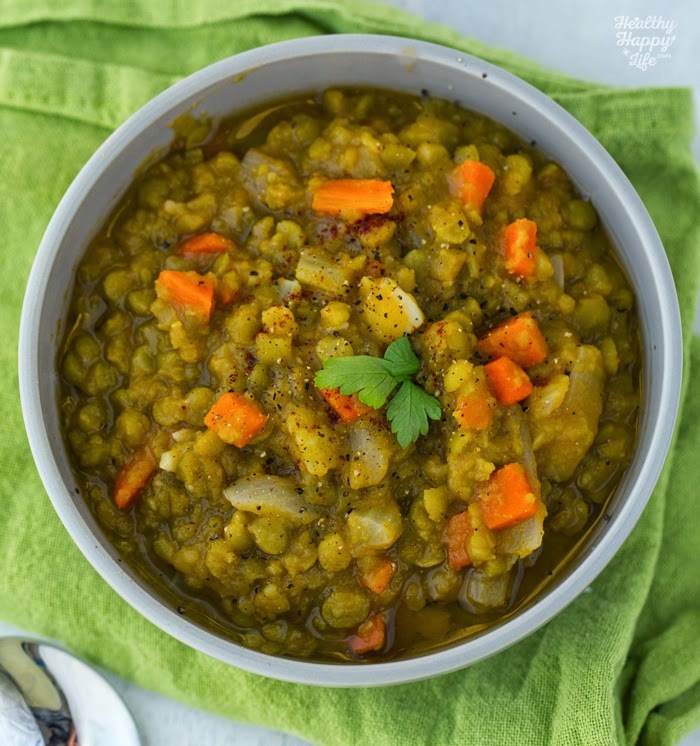 Using split peas and just a few simple ingredients you can be enjoying a delicious bowl of this soup on under a few slow-cooked hours. I am loving this soothing soup that is a good source of plant-based protein - 30 grams in one large bowl!.. Easy Peasy. No Pun Soup. This soup has a few easy accent ingredients like diced carrots, celery and bay leaf for loads of flavor. Smoked paprika adds a smoky flavor and optional nutritional yeast can be added for cheezy flavor and even thicker texture. This soup is delicious for leftovers too. I love a nice slice of toast slathered in vegenaise alongside this soup. Entree Soup. This soup is hearty enough to be a one-bowl wonder style meal. One large bowl contains 30 grams of protein and over 25g of fiber -- over 100% your RDA! Plus each bowl contains 28% RDA iron and 97% RDA of vitamin A. I am in love. 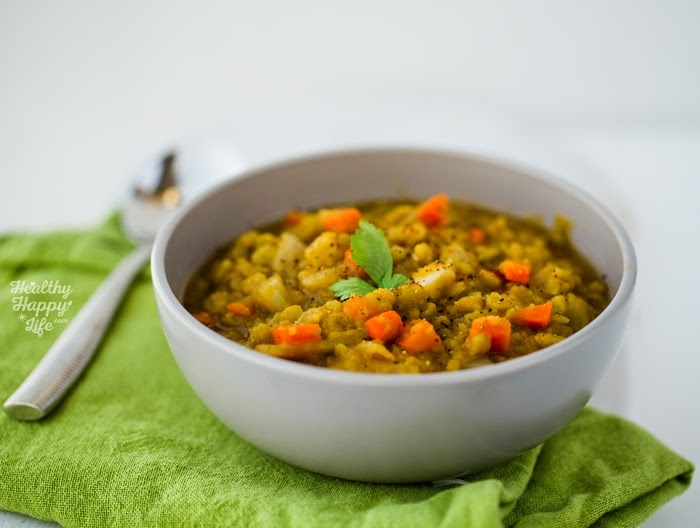 I have posted pea soup here on HHL before, but I LOVE revisiting old recipes and simplifying them. 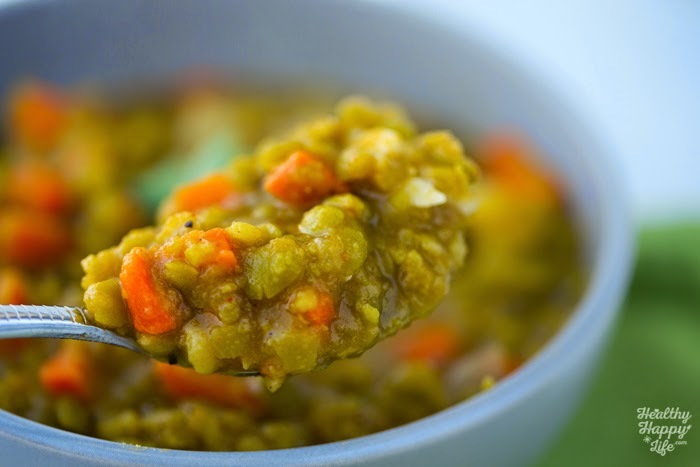 This thick and delicious vegan pea soup is flavorful and speckled with carrots and celery. A hint of smoke and spice. **with the salted veggie broth, you will not need to add additional salt. If you use water in place of broth, you will want to add salt to taste. Add the peas, broth, carrots, celery, onion, bay leaf, paprika, cayenne, pepper and garlic to a large soup pot and bring to a boil over high heat. Cover with lid and lower heat to low. Simmer, covered for about 30 minutes. After 30 minutes check on the soup, this is when you can add in the additional cup of liquid (water or broth) if you'd like. This makes a slightly thinner soup. You can also add in nutritional yeast to taste if you'd like. Cover soup again and continuing simmering for another 20-30 minutes until the peas are very tender and creamy. I like to give my soup at least an hour simmering on low, slow-cooking, until serving. Even longer works too. If you find your soup to be a bit too thin, you can simmer it uncovered for 10 minutes or so to reduce some of the liquid. Serve warm, delicious as leftovers too!